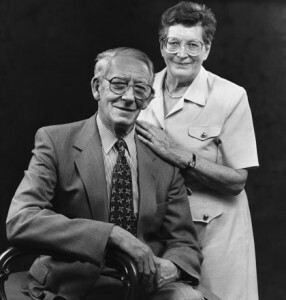 Gordon Wilson and his wife Joan, by Bobbie Hanvey Photographic Archives, John J. Burns Library, Boston College. (Bobbie Hanvey) [CC BY 3.0 (http://creativecommons.org/licenses/by/3.0)], via Wikimedia Commons. As regular visitors to Crossring will no doubt know, I went through a pretty harrowing experience at work a few years ago. As I have sought to move on from this dark time, I have struggled time and time again with forgiveness; how can I forgive the person at whose hands I suffered when he has shown no remorse for his actions, and indeed, seemed at the time to greatly enjoy seeing me suffer. Forgiveness, I have learnt, is incredibly difficult. In an interview with the BBC, Wilson described with anguish his last conversation with his daughter and his feelings toward her killers: “She held my hand tightly, and gripped me as hard as she could. She said, ‘Daddy, I love you very much.’ Those were her exact words to me, and those were the last words I ever heard her say.” To the astonishment of listeners, Wilson went on to add, “But I bear no ill will. I bear no grudge. Dirty sort of talk is not going to bring her back to life. She was a great wee lassie. She loved her profession. She was a pet. She’s dead. She’s in heaven and we shall meet again. I will pray for these men tonight and every night.” As historian Jonathan Bardon recounts, “No words in more than twenty-five years of violence in Northern Ireland had such a powerful, emotional impact.” (Quote from Wikipedia). My experiences pale into insignificance when compared with those of Gordon Wilson, and yet he found in himself the ability to forgive those who had not just injured him, but who killed his beloved daughter, Marie. Forgiveness is difficult, but in the two verses above, which immediately follow Jesus’ teaching of the Lord’s Prayer, Jesus makes it clear that we are expected to forgive those who wrong us. We are not to bear grudges, to return wrong doing with wrong doing, or to withhold forgiveness from others. No, we are called instead to forgive others. This can be not only difficult, but upsetting and costly. It requires us to face up to difficult circumstances, to reflect on painful times, and to love people whom we might ordinarily despise, people who could well have made our lives into a living nightmare. Jesus is clear, though. If we do not forgive others, God will not forgive our sins. If we cannot bring ourselves to forgive then it is questionable just how much we have the true Spirit of Christ within us, how much we have allowed our lives to be transformed by our faith. God does not say this out of spite. Far from it. Our Father in heaven knows just how costly forgiveness is; he gave up his only son to death in order that we might be forgiven. Jesus has the scars of the nails that fixed him to the cross in his hands and feet that demonstrate the costliness of forgiveness. Yet at no time did God falter in his plan, at no point did Jesus falter in following his Father’s mission. It was his death and resurrection that enabled us to be forgiven, to be made right with God, and to gain new life in God’s perfect kingdom. Think today whether there is anyone in your life whom you need to forgive. It might be someone who is in your life at the present moment, or it could be someone who wronged you in your past. Ask God for his help as you strive to forgive them for the pain, the hurt and the suffering that they caused you. And be at peace knowing that if you forgive those who have wronged you, God will forgive you too. This entry was posted in Audio, Bible Reflections, Daily Reflection, Podcast and tagged Matthew. Bookmark the permalink. Enter your email address to subscribe to Crossring and receive notifications of new posts by email. If you've enjoyed Crossring, why not buy me a coffee? You can securely donate £3.20 to my coffee fund using Paypal or your credit/debit card. Crossring is a project from THREE16. Copyright © THREE16, 2000-2018. All rights reserved.